We have already know that the motion of a body is resisted by frictional forces. In vibrating systems, the effect of friction is referred to as "Damping". The Damping provided by fluid resistance is known as viscous damping. 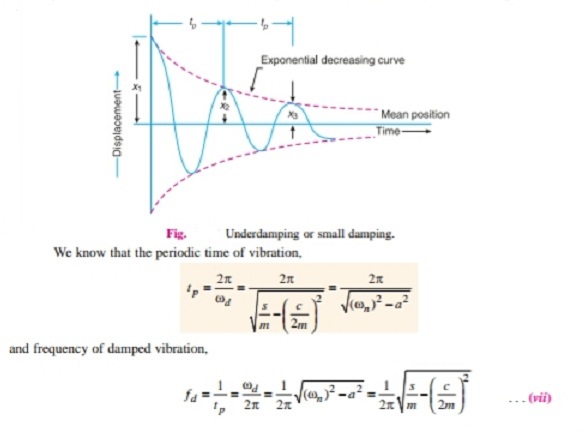 We have also discussed that in damped vibrations, the amplitude of the resulting vibration gradually diminishes. This is due to the reason that a certain amount of energy is always dissipated to overcome the frictional resistance. The resistance to the motion of the body is provided partly by the medium in which the vibration takes place and partly by the internal friction, and in some cases partly by a dash pot or other external damping device. Consider a vibrating system, as shown in Fig., in which a mass is suspended from one end of the spiral spring and the other end of which is fixed. A damper is provided between the mass and the rigid support. 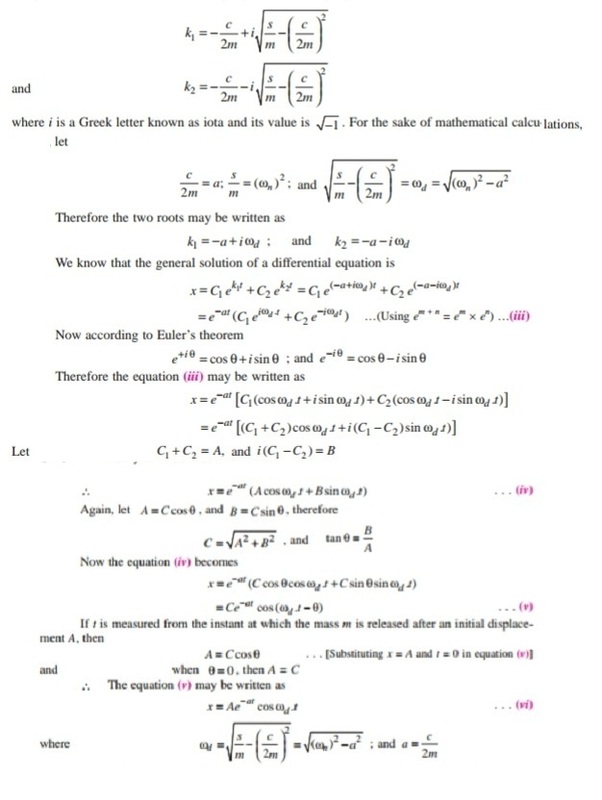 c = Damping coefficient or the damping force per unit velocity. Where C1 and C2 are two arbitrary constants which are to be determined from the initial conditions of the motion of the mass. Note: In actual practice, the overdamped vibrations are avoided. If , then the radical (i.e., the term under the square root) becomes negative. We see from equation (iv), that the motion of the mass is simple harmonic whose circular damped frequency is ωd and the amplitude ae-at which diminishes exponentially with time as shown in Fig., Though the mass eventually returns to its equilibrium position because of its inertia, yet it overshoots and the oscillations may take some considerable time to die away. It is the same as discussed under free-vibrations. then the radical (i.e., the term under the square root) becomes zero and the two roots K1 and K2 are equal. This is a case of Critical damping. 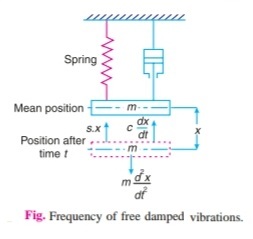 In other words, the critical damping is said to occur when frequency of damped vibration ( fd) is zero (i.e motion is aperiodic). This type of damping is also avoided because the mass moves back rapidly to its equilibrium position, in the shortest possible time. The critical damping coefficient is the amount of damping required for a system to be critically damped.